The INNOVATE-O-thon externship program ran Feb. 9 to 11 at the IMR Innovation Lab on Kinnear Road. IMR hosted the event in collaboration with the Center for Innovation and Entrepreneurship. Faculty members supported students through different points in the development process by engaging and helping them guide themselves toward solutions and identify potential barriers. Through the weekend, students generated a myriad of innovative ideas, including mobile app and technology-based engagement efforts, education and training programs, awareness campaigns and cross-campus partnerships. They were responsible for planning everything from project costs to implementation. Students learned from one another as well. Ruozhao Chen, a major in agribusiness and applied economics, and operations management, was a member of the winning team, whose concept and details of its implementation will be unveiled later this year. “I really like that this was open to all majors, because I think that we all bring a different perspective, and we were all able to learn from each other. That encouraged more collaboration and more teamwork among us,” she said. Chen’s group included members whose majors ranged from materials science and engineering to marketing, and environment economy development and sustainability. That diversity was crucial in generating the range of ideas that allowed her team to take home the top prize, she said. Nicole Sintov, assistant professor of behavior, decision making and sustainability at the School of Environment and Natural Resources, worked with Blanco and students on Friday, during the initial brainstorming phase. Sintov, was hired through the Discovery Themes’ Sustainable and Resilient Economy focus area. “Both Themes had unique sets of expertise to contribute and I enjoyed the opportunity to work with the M&MS folks,” she said. Blanco said the collaborative approach can lead to discoveries that would less likely materialize without it, but it also requires aligning incentives, managing expectations and getting out of one’s comfort zone. 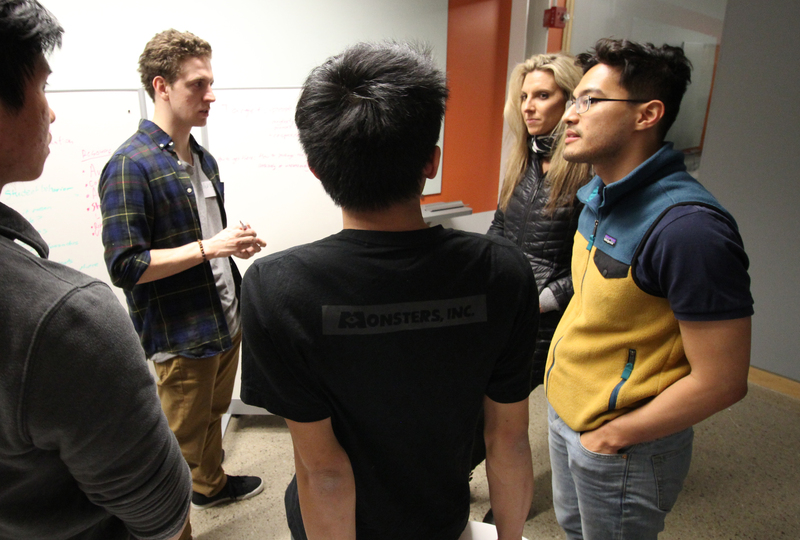 However, the collaboration among students at INNOVATE-O-thon required no guidance by faculty. “The goal of the event was to think of ways to cut energy use on campus, but there is one type of energy that I doubt we can reduce: the student’s energy for innovation,” Blanco said. This entry was posted in Discovery Themes Initiative, Events, News and tagged ENGIE, IMR, INNOVATE-O-thon by mhuson. Bookmark the permalink.